Alexander Steen's shootout goal helped the Blues take the lead in the NHL with a win over the Wild on Sunday night. 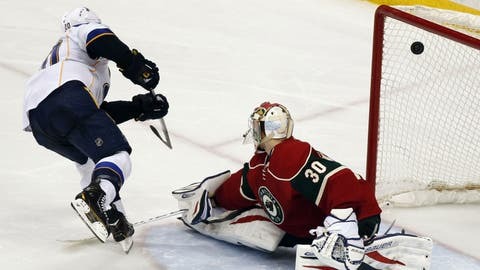 ST. PAUL, Minn. — Not even some inside information from Olympic teammate Zach Parise could stop T.J. Oshie in a shootout. Oshie and Alexander Steen scored shootout goals and the St. Louis Blues took over the top spot in the NHL standings with a 3-2 win over the Minnesota Wild on Sunday night. In his first shootout since his memorable Olympic performance against Russia, Oshie beat Ilya Bryzgalov — a Russian who wasn’t on the team that lost to Oshie and Team USA in Sochi– over his shoulder in the first round. Steen sealed the win in the following round after the Blues’ Brian Elliott turned away Parise and Mikko Koivu. "I think I was talking to Zach about that move tonight over in Sochi and he might have told Bryz what it was," Oshie said about his backhand-to-forehand move. "It seemed like he had me and I got a little lucky. It must’ve just squeaked inside the post. I got a little fortunate on that one, but I’ll keep taking them." The Wild fell behind 2-0 early, but tied it with second-period goals from Jason Pominville and Matt Moulson. Not many teams are able to come back on St. Louis, which only allows 26.4 shots and 2.22 goals per game. "I think that they thought they were going to take it to us physically and I think our guys responded to that," Wild coach Mike Yeo said. "I think we got into it, we started being physical on their defensemen. We really started to get in our game and from that point on, I thought we were the better team." Oshie and Carlo Colaiacovo scored on the second and third shots of the game for St. Louis. It was Colaiacovo’s first goal since Feb. 11, 2012, a span of 42 games. Bryzgalov had 21 saves in his first start for Minnesota since coming over in a trade with Edmonton on Tuesday. Like Oshie, Bryzgalov also thought he had the save in the shootout. "You know, pretty much I almost had it. I don’t know how he raised it over the shoulder," he said. "I thought there was no way to go for him. I was completely surprised he scored on that one." The "legend" of Oshie in shootout situations continues to get bigger, even among teammates. "When I see Osh going in on a shootout, I kind of giggle," Blues center David Backes said. "I told him afterward that the goalies are starting to play like soccer goalies because they’re just guessing left or right. He’s got moves left, got moves right, got moves straight ahead. It’s pretty special to watch and I’ve seen it a lot." The momentum shifted in the second after Pominville scored at 3:11 to make it 2-1. Moulson tied it 4 minutes later with his first goal in a Wild sweater since being acquired in a trade with Buffalo on Wednesday. Mikko Koivu intercepted a clearing attempt and zipped the puck to Moulson, who was in front of the net and knocked it past Brian Elliott. Elliott stopped 17 shots and kept the game tied at 2 with a lunging stick save to deny Mikael Granlund with 13 minutes left in the third period. "I tried to kind of charge him because I thought he was going to tip it," Elliott said. "He managed to stop and pull it around me, so it was desperation. I try to rob the guys in practice and sometimes it pays off when you can make those stick saves in games." Granlund was again denied by Elliott from in close early in the overtime session. The Blues have won 16 in a row against the Central Division and are now 18-0-1 in division play. They’ve beaten Minnesota eight straight times, outscoring the Wild 25-10. The Wild are 14-6-2 since Jan. 2, but lost their second straight after a five-game winning streak. Both teams played Saturday night and appeared tired at the end of the third period and in overtime. There’s still a ways to go, but both teams could end up facing each other in the opening round of the playoffs. "It’s a team that, in all reality, we could be squaring off against in the playoffs too," Parise said. "I know there’s a long time until that, but I thought we matched up well against them. We like the way we played. Some great opportunities at the end, just wouldn’t go for us." NOTES: Blues F Magnus Paajarvi was a healthy scratch and was replaced by Chris Porter, who was recently recalled from AHL Chicago. … The Wild didn’t register a shot on goal until 7:02 of the first period. St. Louis didn’t get a shot for the first 12 minutes of the second period. … Minnesota’s Kyle Brodziak and the Blues’ Steve Ott fought 2 minutes into the game.